The outside temperature is dropping, the days are growing shorter, and your cats don’t seem to play as much. Are they cold, sick, or simply hibernating? Here is some information that can help you determine what’s going on with your cat in the winter months. Bears, chipmunks, and bats all hibernate. They increase their body fat in the months leading up to winter and find a safe spot to hunker down until spring. But hibernation is more complicated than simply sleeping away the cold months. It’s about conserving energy, which means slowed breathing and heart rate, a drop in body temperature, and lowered metabolic rate. For months, they rely on the stored fat in their bodies as their primary food source. Some animals go about their day normally and retreat into torpor, a kind of light hibernation, at night. Others go into a deep slumber that can last for a long time. The former is triggered by temperature and the availability of food, the latter by hormones and the length of day. Cats sleep fifteen to twenty hours a day no matter the season. As predators, they’re predisposed to be active around twilight—the time of day when their prey is most likely to be out and about. Out in the wild, survival means most of their energy has to be spent on hunting. All that stalking, running, pouncing, and digesting requires a lot of sleep to build up their energy reserves. That’s why you’ll find most cats either napping or in a deep sleep throughout the day or during the darkest hours of night. In other words, they adapt their sleeping pattern around mealtimes. For domestic cats, this means sleeping during the day when their owners aren’t home and being active at night. In fact, you can use this knowledge to minimize your cat’s hardwired need to zoom through the house when you’re sleeping. Cats will adjust their behavior for a number of reasons, including their owner’s schedule, how much they’re fed and how often, and even the amount of light they receive during the day. Appetite, sleep pattern, and energy can all change from season to season. Do Cats Hibernate In Winter? Despite their sensitivity to the environment, cats in the wild do not go into true hibernation. Big cats have evolved by growing a thicker coat, and they continue to hunt and eat all through winter. Feral cats are also active year-round. In colder climates, they may also need the help of human caretakers to survive to spring. In extreme weather, cats, as well as other non-hibernating mammals, have been known to go into torpor, but a torpid or lethargic cat may also be a sick cat. Shivering, cold ears and paws, lack of energy, and a slower heart rate are all symptoms of hypothermia–a dangerous condition that can lead to death. So, How Does Winter Affect My Indoor Cat? Dr. Elizabeth Colleran, a senior veterinary surgeon with People’s Dispensary for Sick Animals, believes domestic cats can suffer from seasonal depression. If a cat’s behavior can be triggered by exposure to natural light, the onset of winter can adversely affect them, too. In addition to a drop in temperature, winter brings lifestyle changes, including shifts in household schedules, an end to daylight saving time, and holiday parties. Leave a light on or open curtains before you leave for work so your cat isn’t stuck in a dark house all day. 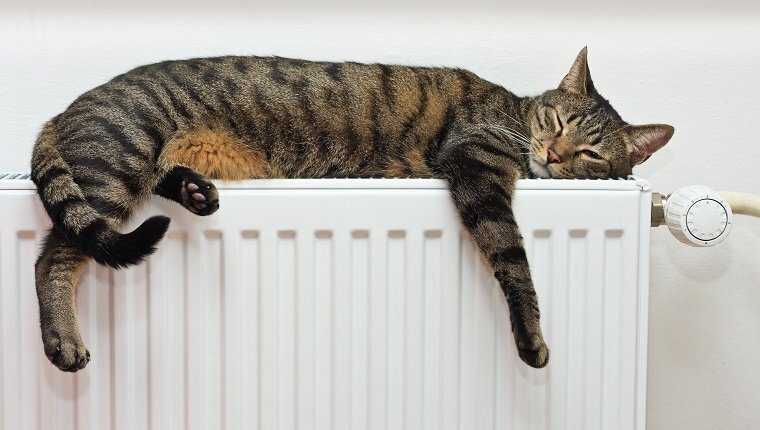 If you keep the heat off to conserve energy, give your cat a warm place to sleep like a semi-enclosed or heated bed. Make sure your cat’s litter box isn’t placed too close to a heater or in a cold, damp basement. Play with them often, especially on those days when all you want to do is turn on Netflix and curl up on the couch with a mug of hot chocolate. Keep a close eye on older cats. Arthritis and other age-related illnesses may flare up during colder months. 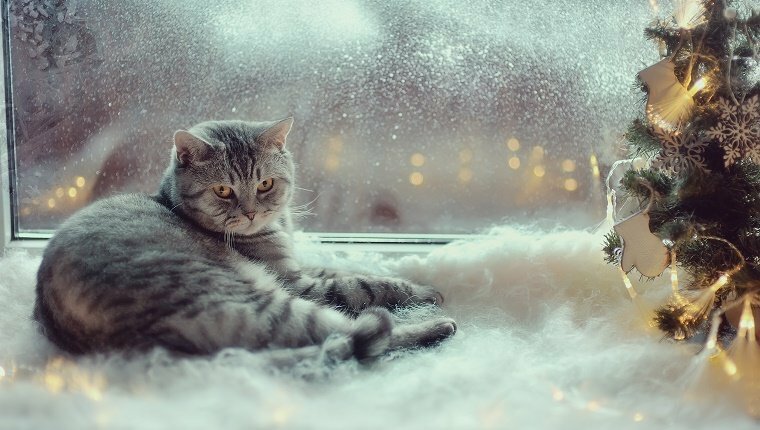 Cats are known to be stoic about their discomfort, so it’s up to us to anticipate their needs, especially during winter. They may not hibernate, but like us, they can get cold. 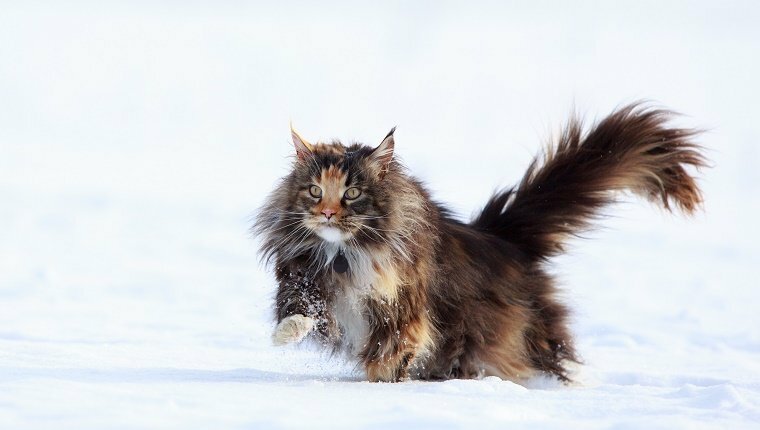 Have you noticed changes to your cat’s behavior during winter? Tell us in the comments below!